Stephen Bannon arrives before the presidential inauguration at the US Capitol on Jan. 20. Tossing out the rule book might work in politics, but it’s eminently dangerous when it comes to national security. That’s why the appointment of Stephen Bannon to the National Security Council should ring alarms for the intelligence community, and for anyone concerned about governmental checks and balances. 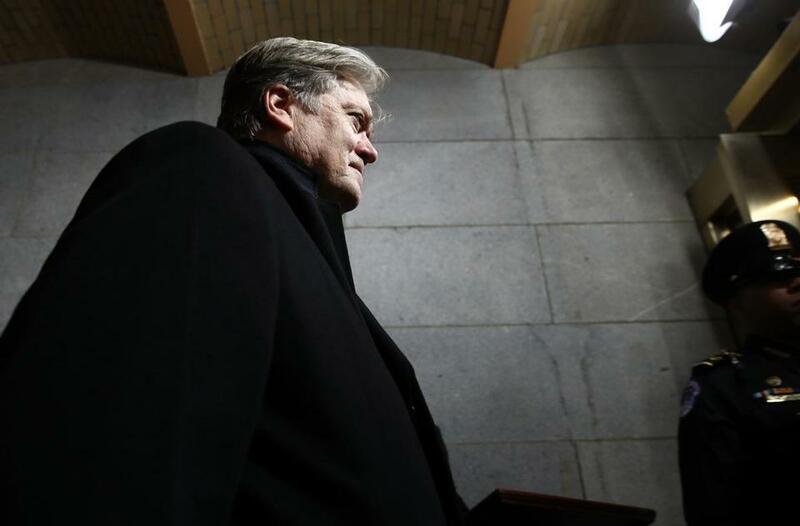 In a flurry of logic-defying executive orders last week, President Trump elevated Bannon to the NSC “principals committee,” giving the former executive director of Breitbart News the same standing as the secretary of state, the secretary of defense, and the secretary of homeland security. Bannon, the president’s chief strategist, has neither the experience nor the temperament for such a sensitive, high-visibility position. Although there was some speculation about whether Bannon’s appointment requires Senate confirmation, Harvard University law professor Laurence Tribe tweeted that while his new role is “crazy and dangerous,” it doesn’t seem to violate the law. But no White House political advisor has ever served on the NSC principals committee. Ever on the defensive, White House press secretary Sean Spicer did what the new administration does best: He turned the debate back to the alleged depredations of the Obama administration. It’s true that Obama advisor David Axelrod was invited to observe some NSC meetings from the sidelines, but he was not a regular and not a member of the elite committee. One of Trump’s Republican predecessors, George W. Bush, excluded Karl Rove, his domestic political advisor, from similar meetings. Bannon could ultimately garner even more influence because of the abrasive and increasingly unpredictable rhetoric of National Security Adviser Michael Flynn, the nominal head of the NSC, who once claimed that Islam aims to enslave humanity. This week, in his first public statement since taking office, Flynn reportedly ignored Pentagon advice and lambasted Iran for a missile test, saying the Trump administration is “officially putting Iran on notice.” Adding Bannon, who has no foreign policy expertise, makes for a combustible mix in the nation’s most vital security organization. The NSC, created in 1947, was born out of the exigencies of World War II and the need to better manage foreign policy complexities in a nuclear age. Its charge: to decide nothing less than issues of war and peace. Councilors delve into the nation’s intelligence secrets and debate lethal counterterrorism strikes. Perhaps it’s unreasonable to expect that the NSC would be completely devoid of politics. But it is indeed perfectly reasonable to expect that it should not go rogue and include a propagandist like Bannon, with his penchant for paranoia and conspiracy theories. The National Security Council needs buy-in from Washington policy makers who make the government work and project a national image of continuity, strength, and stability abroad. There’s no room for irrationalists like Bannon. He should be sidelined or returned to a role appropriate for a political operative.